There are many different options when it comes to choosing a personal alarm. Some personal alarms in the U.K are worn on lanyards or a key-ring. Some emit a piercing sound to startle would be attackers, while others have GPS tracking to inform people of your location. 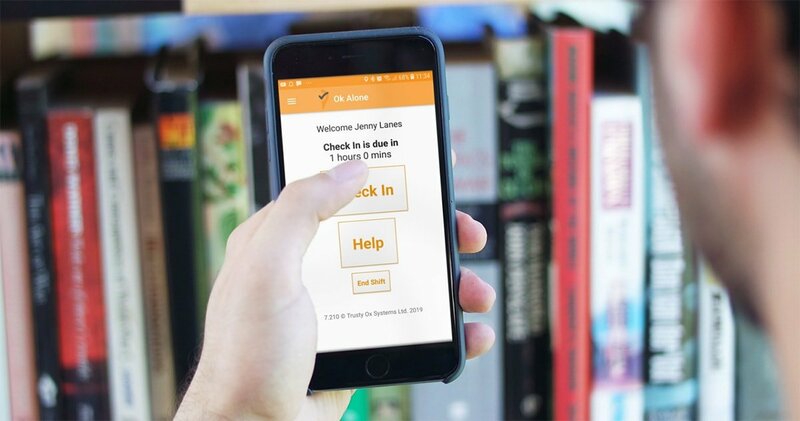 The Ok Alone App can also be used as a personal alarm even if you aren’t at work/on shift. If you find yourself in a worrying situation, all you do is go to the Ok Alone app, click ‘start shift’ followed immediately by ‘help’ and your alert will be sent to your monitor (even outside of work hours) or the live call centre. A lot of injuries or incidents at work can be avoided by using common sense. Take the extra time to make sure you are familiar with your work environment and any hazards it presents. Plan your most difficult tasks for when you are most focused, not first thing in the morning when you are still half asleep or the end of the day when you are tired, and your concentration is waning. Take regular breaks and make sure you don’t skip meals. Use your equipment correctly, don’t use the wrong tool for the job because the other tools are further away. Wear the safety equipment required to complete a task. DO NOT go to work under the influence of drugs or alcohol. Make sure all emergency exits are clear and not blocked by items being stored. As previously stated, it is common sense and not rushing through your jobs that will help keep you safe at work, but if you do have any concerns bring them to the attention of your supervisor or manager. Think about where and how you park your vehicle. When possible, park near the exit in a car park, or park in a well-lit area if it will be dark when you return. Point your vehicle in the direction you’ll want to leave so that you can quickly drive away if necessary. Always approach your car with the key in your hand. Always check the back seat of your car before getting in. Keep your doors locked and your windows up when in any built-up area. Always lock your doors when you leave the car while paying for fuel, especially at a large petrol station. Carry a map so you do not have to stop to ask directions (even if you have Sat Nav, it can fail). If (you think) someone is following you, do not lead them to your house. Instead, drive to a crowded place or to a police station. Make sure your car is in good working order (keep it serviced and maintained) with enough fuel for the journey. Consider the need for carrying spare fuel so that you do not get stranded. If your car starts to splutter or sounds unhealthy, drive to a garage or to the nearest telephone on the motorway. Do not “limp” on until it dies (potentially) in the middle of nowhere. If you do break down, try to decide whether to lock yourself in and wait for help. If you do breakdown on a motorway, remember that the hard shoulder is a dangerous place. You’re more likely to be injured sitting in your car than attacked sitting at the top of the bank waiting for your breakdown service.